One of the most difficult areas to lose fat from is your stomach fat. The belly fat accumulated there is by far the most challenging areas for many people. If you do a poll asking people what their least favorite body parts were, I would not be surprised to a majority responded with their belly fat being their least favorite. Most are aware that eating fatty foods, high levels of stress, and sedentary lifestyle and lack of physical exercise are all contributing factors to becoming fat and having excess tummy fat. In today's fast paced society, regardless if your single, married, have kids, or have no kids, you're in a constant struggle to balance work, life, and family, and always seek the quickest solutions and fastest foods. Yet, there seems to be little time left to yourself - to relax, lift some weights, and blow off some steam. Your bad habits quickly catch up to you - you're out of shape, with a poor body composition (high body fat and not enough lean muscle mass), and the spare tire around your waist gets bigger and bigger. You seek a quick solution to lose your belly fat fast - you try some belly fat diets that doesn't seem to work, or use fat burners that only make you feel sick to your stomach - in the end, you're back where you started with a fat belly and still wondering how to lose your belly fat fast. Now, you have to take your weight problem - especially your belly fat problem - seriously. More than just an un-appealing physical appearance, the ever increasing belly fat and tummy fat is also a serious health threat. There are numerous recent studies that have linked high abdominal fat to increased risks of cardiovascular diseases and cancer mortality,  and increased mortality risk . Having excess tummy fat is no long an appearance issue, but a serious health threat that you need to take seriously and take steps to burn belly fat and reduce your overall body fat for better health. Previously, the major reason why anyone went through great length to lose belly fat was to look good. No one likes a chunk of unsightly fat hanging on their gut. But now, as many studies have found, it's imperative to lose your belly fat for long term health and reduce your risks for various health risks. There are plenty of evidence to show that having high abdominal fat is linked to cardiovascular diseases. In a 2008 study of abdominal adiposity and mortality involving 44,636 subjects, 3507 death were identified including 751 cardiovascular deaths and 1748 cancer deaths during 16 years of follow up. It was found that abdominal obesity was highly associated with elevated cardiovascular disease mortality. The study found that the BMI (body mass index) was not associated with greater risk of death, but that elevated waist circumference was associated with significantly increased cardiovascular mortality even among normal-weight women . While the Body Mass Index (BMI) is widely used to assess "normal" weight for an individual based on his or her height, it does not take into account other more important factors such as body fat percentage and body composition. Based on the BMI, a normal BMI range is between 18.5 to 25. Having a BMI of 25 to 30 is overweight, and having a BMI of over 30 is considered obese. The biggest issue with the BMI is that it does not take into consideration a person's lean body mass and body fat mass. Two individuals with the same height and weight would have the same BMI, but they could have significantly different body compositions. Person A could have much lower body fat and higher lean mass compared to person B who has much high body fat simply because muscle mass weighs more than fat mass. It should come as no surprise that having excess belly fat and having a high waist to hip ratio is highly associated with cardiovascular diseases and mortality as various studies have discovered. If you are overweight or obese, it is important to take the right steps to begin reducing body fat and losing your belly fat. Getting rid of your belly fat is no easy business. When it comes to losing tummy fat and body fat, a clear distinction must be made between "Weight Loss" and "Fat Loss". Weight loss can be a reduction of body weight by any means - flush out water using a diuretic, getting rid of wastes through colon cleansing, lose some muscle, lose some fat, or losing a limb or two. These are all "weight loss". After all the end result is you losing weight one way or another. Fat Loss, on the other hand, is an entirely different issue. 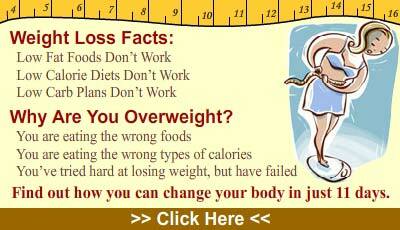 To lose weight, your ultimate goal is to burn off body fat and to lose belly fat. To get rid of body fat, you need to tap into long term stores of energy - body fat, and the only way to do this is with a calorie deficit. When you lose weight, body fat is not the only thing that is lost. Other sources of energy such as carbohydrates and proteins are also burned as energy during your weight loss. During this process, you can also end up losing some lean muscle mass as well, which is the least desirable effect of a weight loss program. Unlike body fat, your muscles expend energy, thus help you burn off calories. As you lose muscles, your metabolic rate also decreases making weight loss more difficult. Excess body fat and obesity is a leading cause of health problems. As studies have found, there is a direct link between having high amounts of abdominal fat and cardiovascular disease and mortality. Research has shown that even for normal weight individuals, having most of your fat in your tummy area increases your health risks. Some extreme cases of obesity will require more than just diet and exercise such as prescription drugs or surgery; however, for most cases, a good combination diet and exercise will do. There are certain things you can do that will help you lose belly fat and body fat. Train using shorter, high intensity cardio workouts. 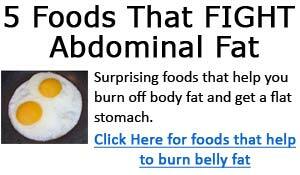 In the following articles, we'll cover some of these tips on losing belly fat in more detail. 1. Circulation. 2008 Apr 1;117(13):1658-67. Epub 2008 Mar 24. Zhang C, Rexrode KM, van Dam RM, Li TY, Hu FB. 2.Am J Clin Nutr. 2006 Aug;84(2):449-60. Weight, shape, and mortality risk in older persons: elevated waist-hip ratio, not high body mass index, is associated with a greater risk of death. Price GM, Uauy R, Breeze E, Bulpitt CJ, Fletcher AE. 3. Acta Obstet Gynecol Scand. 2009;88(3):308-13. Bergström I, Lombardo C, Brinck J.